One of the most important museums for the history of art. In it's collection are included some of the most beautiful works of the plastic art of the archaic and classical period. 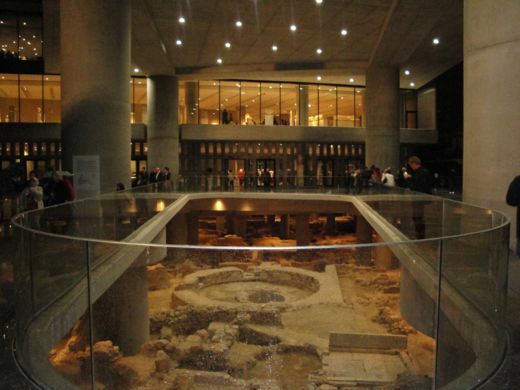 The Acropolis Museum, together with the National Archaeological Museum, are the two leading museums of Athens. were round the Acropolis in the early 6th century BC, until their complete destruction by the Persians in 480 BC. 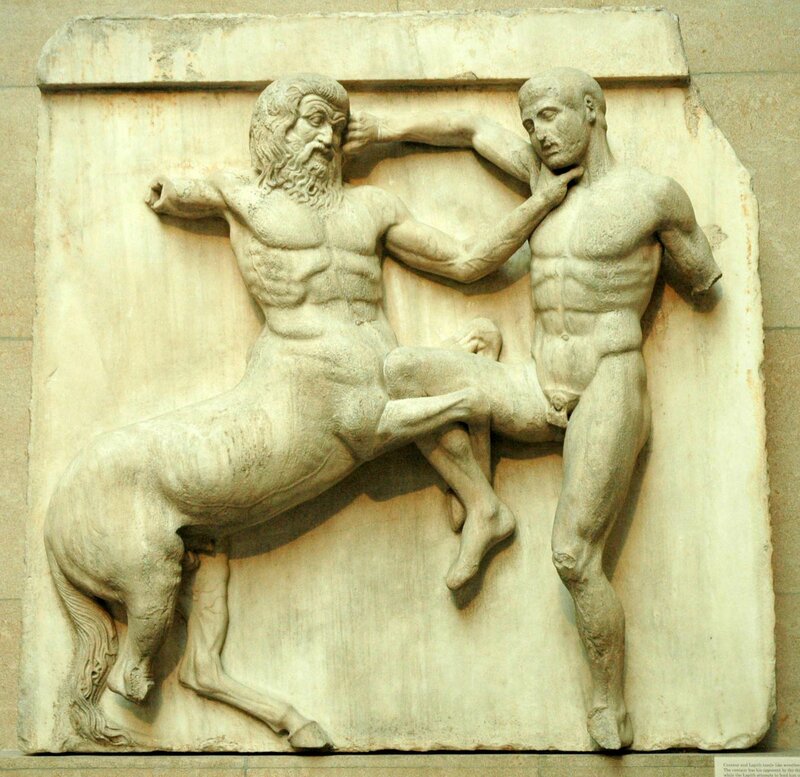 Two of the painted pediments which were decorating the entrances of the ancient temples were: the one that represents the labours of Heracles with the Lernaean Hydra and the other with the fight of a lion with a bull. They come from a very ancient temple (probably the primary Parthenon). Also exhibited, the impressive head of Gorgon's or Medusa's, and a part of her waist, which was belted with snakes. It was the central acroterion at the top of the triangular pediment of an archaic temple. 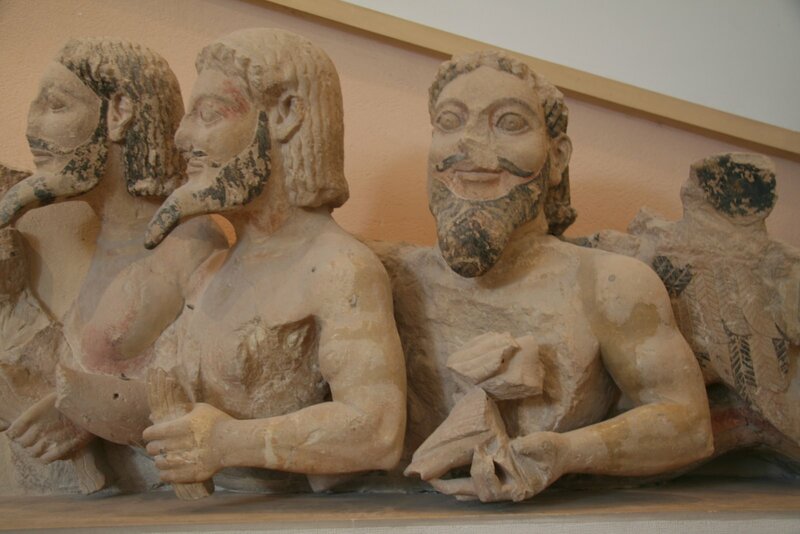 In the same gallery, inter alia, is placed an impressive limestone pediment depicting the struggle of Hercules with the sea demon Triton in it's left side, and the three headed demon, who is consisting of three male figures with bodies resulting in three helical snake-tails in the right side. It comes from either the archaic temple of Polias Athena, or from Ekatompedos, the first Parthenon. 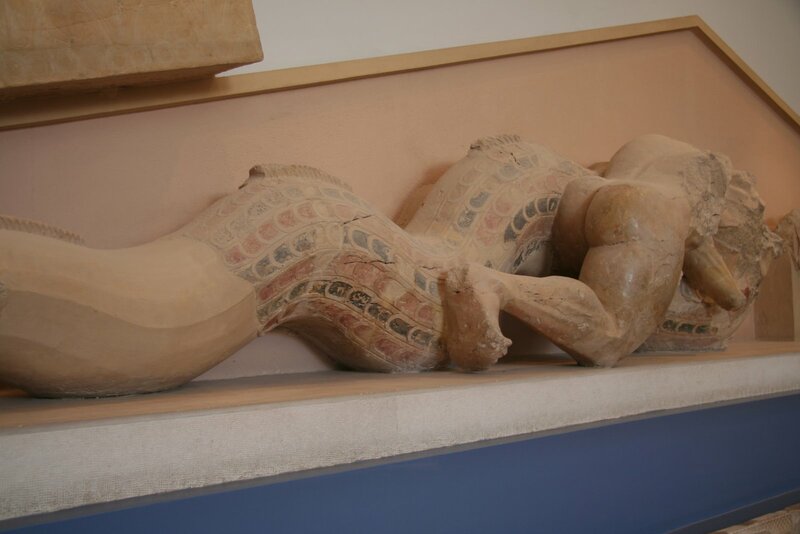 This is a work of an unknown sculptor of the 6th century BC, where the vivid colours are saved. In another smaller part of the pediment is represented the apotheosis of Herakles (the welcoming from the gods of Olympus). The central part of another pediment of an archaic temple, with the impressive sculptural composition, in bright colors, two lions that devour a bull. Make sense also the parts of the entablature of another unknown archaic temple of the 6th century BC, and a sphinx. Two showcases are placed: one with clay figurines and busts, fine examples of the evolution of the coroplastic art in Athens, which are dating between 520 and 480 BC, and the other with small clay relief paintings with painted decoration, offerings for the gods who were worshiped at the holy area of Acropolis. 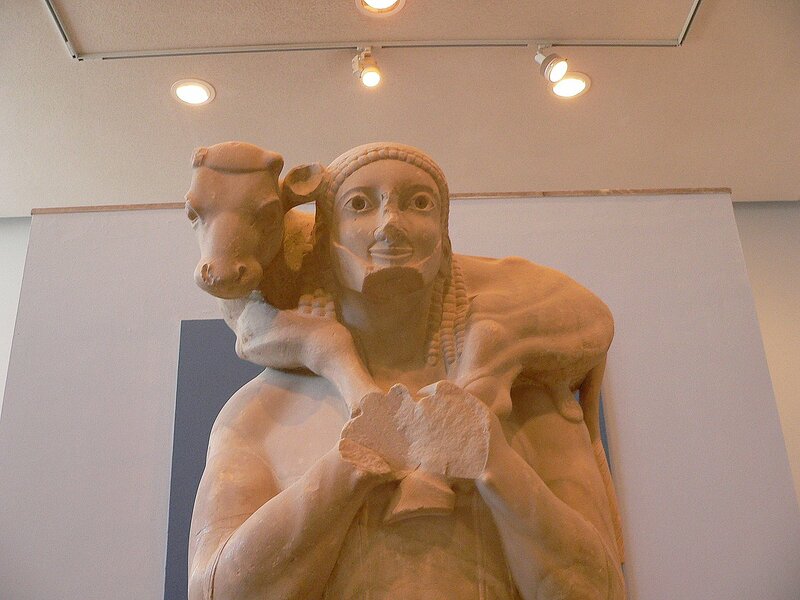 One of the most famous statues of the Archaic period is Moschophoros, representing a young pilgrim with a friendly smile in his lips and a little calf on his shoulders, an offering to the goddess Athena. It is dating approximately at 570 BC, with marble from the mount Hymettus. BC. The goddess Athena is depicted there for first time in a gable since changed the deathly thematology which appeared there till then, holding her spear and the aegis, the miracle weapon that had been given by her father Zeus, above a fallen giant, who believed to be Enceladus. An hermaic stele, a roman copy of an original work of Alkamenes, a student of Phidias, and the complex of Procne, the daughter of the mythical king of Athens Pandion, Alkamenes work too, who is preparing to kill her son, Itys. On the first floor is exhibited a unique collection of Kores. 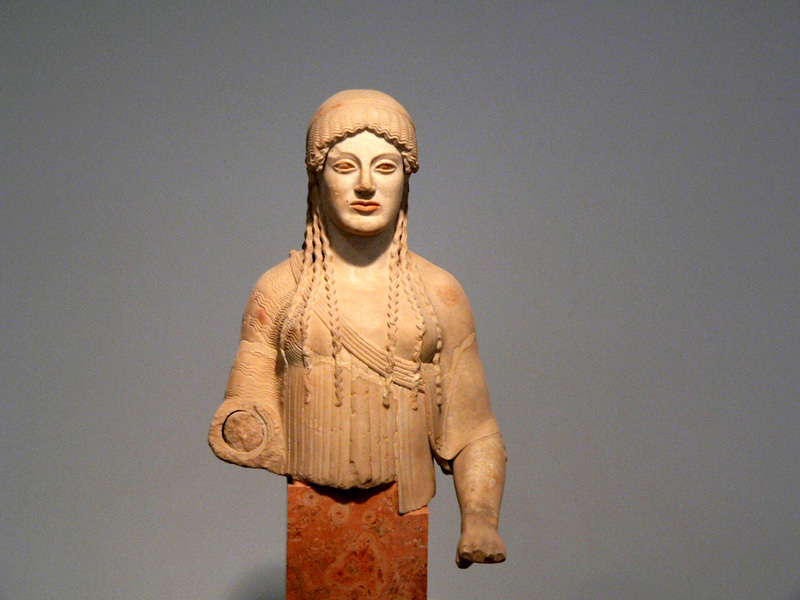 The peplophoros or Peplos Kore, with the colored eyes, the rich headdress, the ionic chiton and the smile on her lips. The Chian kore, the little kore with the crown in her hair, the earrings and the chiton which is still maintaining it's strong color, and the so-called Kore of Lyon, which holds a dove, the full of confidence tall Kore with the sophisticated prettiness and her rich headdress, the enigmatic and seigniorial kore, with more restrained smile than the others, a work of a great artist from the late archaic period. front of her chest, the body of a kore who is holding an apple in front of her chest, a kore of Naxian marble wearing a chiton and a himation. 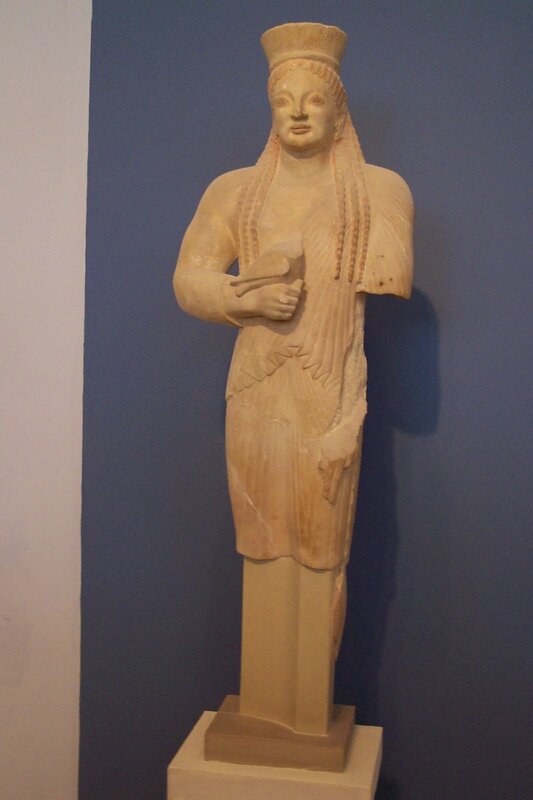 The Euthydikos Kore (called and boudeuse - blue), a statue in which coexist late Archaic elements - such as the Ionic chiton, before being replaced by the dorian peplos (veil)- and evidence of the severe rhythm, as the smile has not disappeared completely, but the face characteristics have already been hardened. It's a work of about 480 BC. Particular attention deserves the famous Rampin rider (named after the collector who had held the head of the statue before he handed it over to the museum of Louvre, from which the plaster cast was made, and placed in the remaining original body). The statue is assigned to the sculptor Phaidimos. 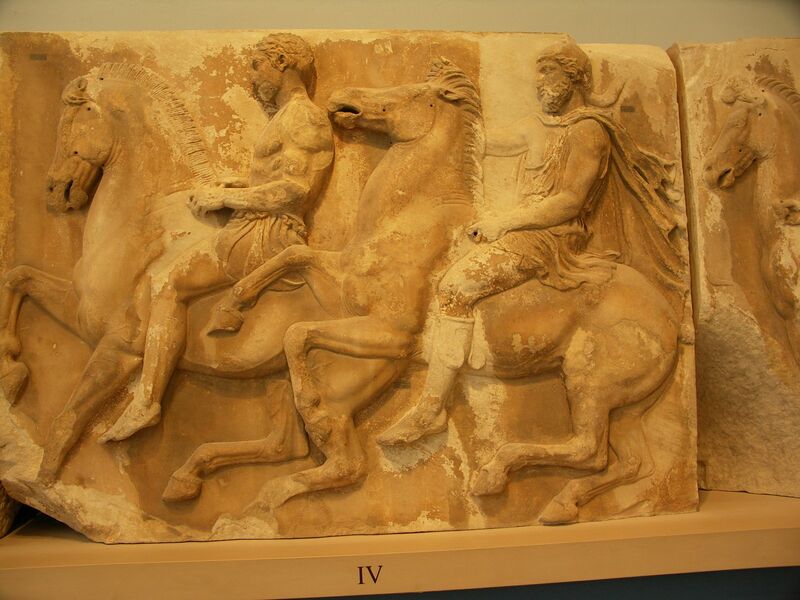 Impressive is also the couple of the Persian and the Athenian horsemen, who are exhibited in the museum, after years of conservation and restoration, from May 1999, along with other archaic horsemen. 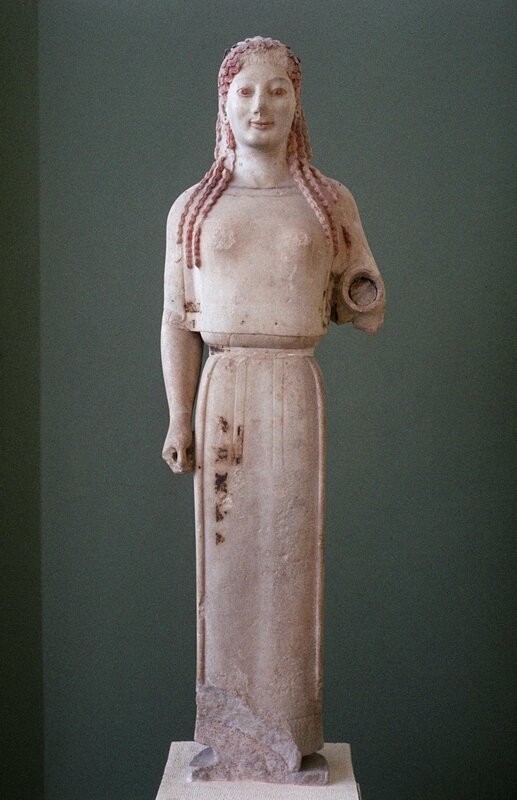 Among the collextion of kores, has been placed a headless statue of Endoios Athena, a typical example of statues which depicting the goddess enthroned, probably is the same statue which Pausanias mentions that he had seen during the 2nd century AD in the Erechtheion, and another great kore, probably a work of the sculptor Antenor. 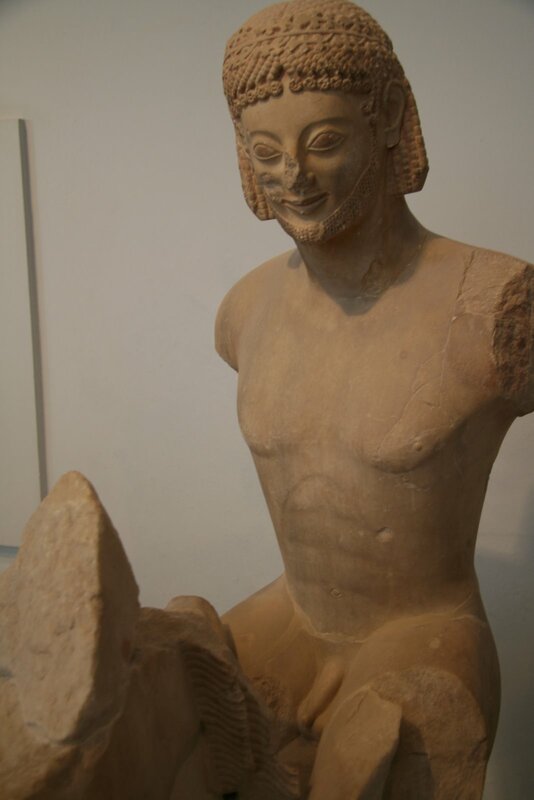 Are hosted also some of the best samples of the so-called Severe Style, which dominated from the early 5th to middle 5th century BC, which it's main characteristics were the naturalness in the performance of the body -that starts to move-, and the severity of the faces, while is disappearing the smile that characterized the statues of the Archaic period. One of the most famous reliefs of the ancient world, the Mourning Athena, with the goddess resting her head meditative on the edge of her spear. The Kritios Boy (or Kritias Pais), with the excellent organic performance of the body, a suggesting smile and good combing hair, and the so called blond kouros (or blond ephebe also, who took his name from the yellowish color was visible in his hair at the time of his finding), the athlete with an almost melancholy expression and thoughtful eyes, probably work of Hegias the teacher of Phidias. 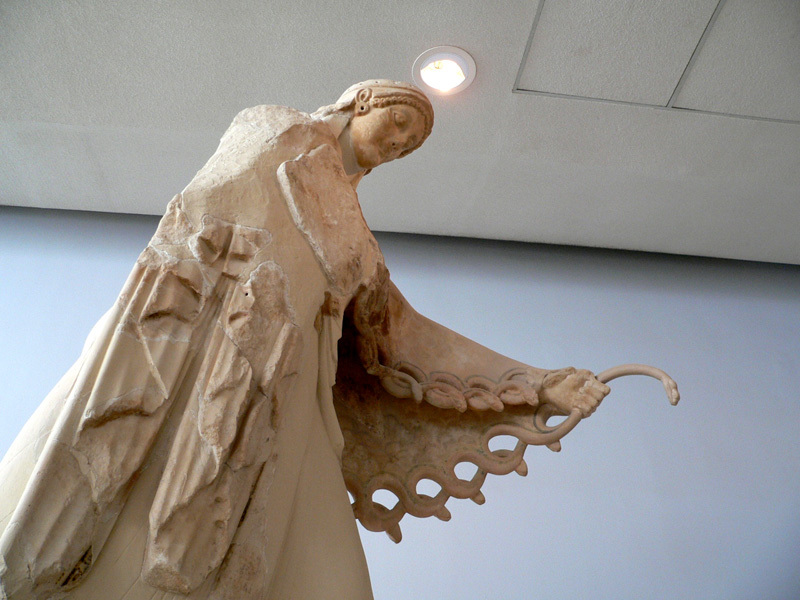 With the sculptures of the classical period of Parthenon, the ancient Greek sculpture reached its highest point. The 92 metopes with subjects from the Gigantomachy, the Centauromachy, the Trojan war and the Amazonomachy, which was located on the outer side of the monument, the frieze with total length of 160 m. and height of 1.06 m. with topics from the sacred ceremony the Panathenaea and surrounded the walls of the cella of the temple, and the two pediments with a representation of the birth of the goddess Athena in the east, and the dispute of Athena and Poseidon in the west, which constituted an integral part of one of the most important monuments of the ancient world, the Parthenon. Today, from all the above, and until the return of the extracted from Elgin sculptures, which are now in the British Museum in London, are exhibited very little samples. Specifically, the small models of the two pediments placed in the walls, the complex of Cecrops with one of his daughters, the body of Poseidon from the west pediment, and the bodies of Hephaestus and Selene from the east pediment. Around the second floor are exhibited some original parts of the frieze, ie that with the Olympian gods watching the procession of the Panathenaea festival into the right, three youths bearing hydrias on their shoulders, while a fourth bends to pick up his own, young people leading a calf for sacrifice, the older man who are holding olive branches, the chariot of the four horses in motion, and finally, the horsemen who were keeping metal reins, which have not been survived. 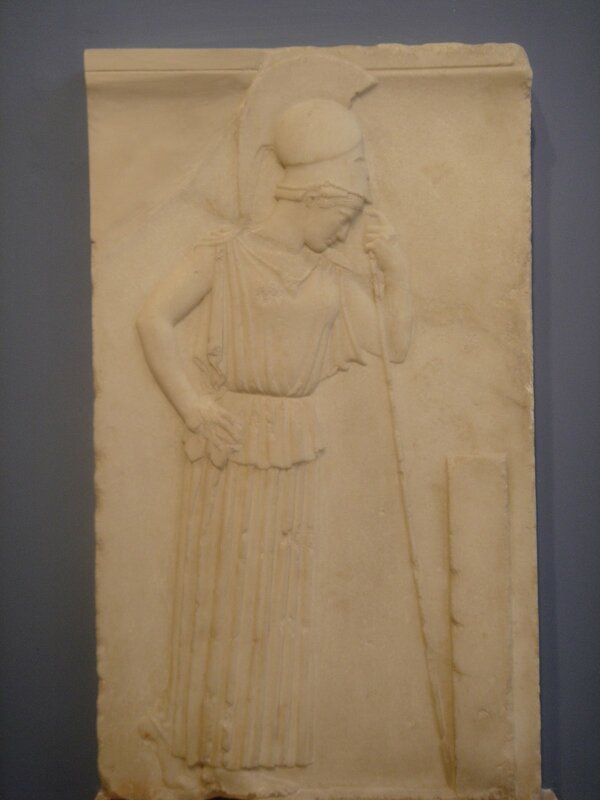 A stele from the parapet of the temple of Athena Nike, which shows a representation of an armed Athena, and a Nike, and beside this another stele from the same temple, with a scene of a Nike who is adjusting her sandal, known as the sandalizousa Nike. 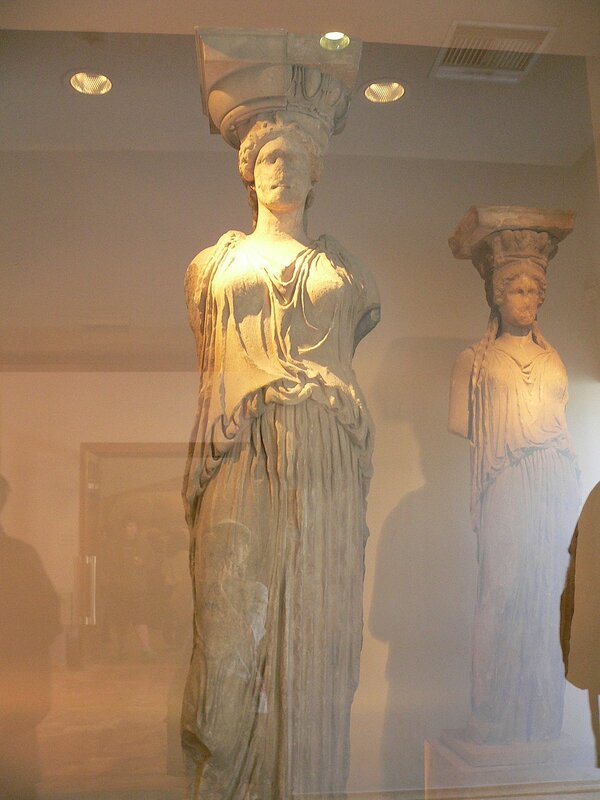 In the first floor of the museum are standing impressively four of the six kores, known as Caryatids, who transferred there some years ago from Erechtheion, to be protected against damage from the air pollution of Athens. 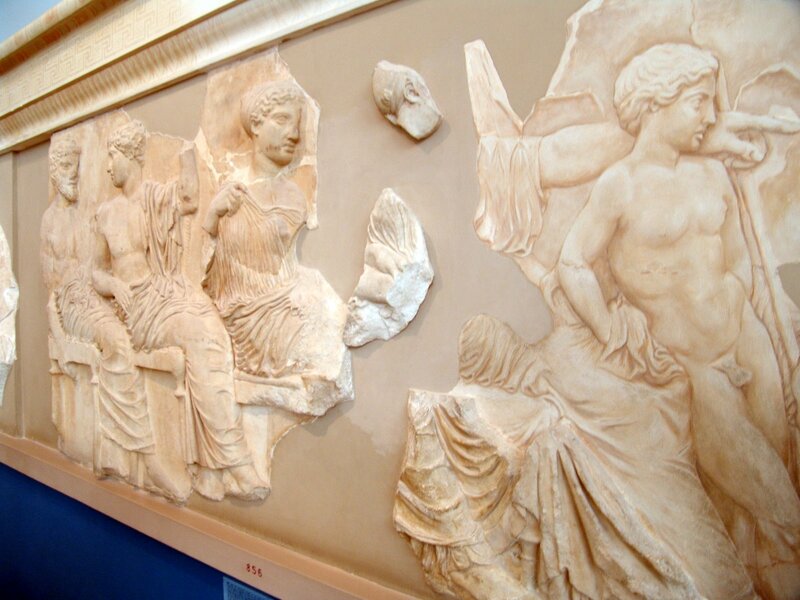 By May 1999 is exhibited one masterpiece of the classical art, the frieze of the small temple of Athena Nike, which was built around 420 BC at the right side of the Propylaea, and is assigned to Agoracritus sculptor. On the three sides of the frieze are depicting scenes of the battles between Persians and Greeks, and in the fourth side the gods of Olympus with the goddess Athena in an honorary place.